My young parents visited her now and then. One day, my mother chose two dolls for me. Smitten with whimsy, she selected Raggedy Ann and Petunia. Mom could have bought the former in a toy store or from a catalog. Hers was a familiar face. Petunia’s was not. She was one of a kind. I liked Raggedy Ann, but she didn’t have my Baby Beans’ allure—sweet plastic face, soft cloth body, and string-activated voice—or Petunia’s uniqueness. I don’t know why I loved Petunia. Another child might have been uninterested in her difference—her brown body and fuzzy yarn hair. I liked that she was special in that way. Petunia seemed calm and centered. She wasn’t meant for antics. That could have been my imagination. Possibly, Tante Nan imbued a little more life into the doll, a subtle magic between creator and creation, which attracted my mother, then me. Poor Petunia was left outside in a rainstorm and suffered from a terrible case of mildew. She did not survive. She endures through memory, proof of her existence in a photograph. My maternal grandmother could make anything out of fabric. Anything. She made clothes, costumes, curtains, slipcovers, and quilts. She had the right-brained creativity and left-brained precision to turn textiles into objects of comfort and art. When I was eight, she taught me to sew. I inherited her manual dexterity and knack for spatial relations. Since then, I’ve made clothes, curtains, pillows, and slipcovers as well as hemmed countless cuffs and sleeves. My favorite projects have always been toys. My first attempts were clumsy and comical. There were many ragged edges, crooked hems, and seam lines drawn in indelible ink. I’d work from patterns in books and magazines, sometimes using a technique but not following instructions. François came to be in that way. I attempted him in soft sculpture. This method involves making stitches under and around tufts of stuffing to create facial features or make a raised design. Although I was only nine or ten when I made him, I was well aware of cultural stereotypes. François was a French chef, complete with an aloof expression, thin mustache, and red-checkered apron and neckerchief. The clean, used sock that served as his skin gave him an ashen complexion. I can’t account for why my proclivity for detail prompted me to give him round little toes but no shoes. 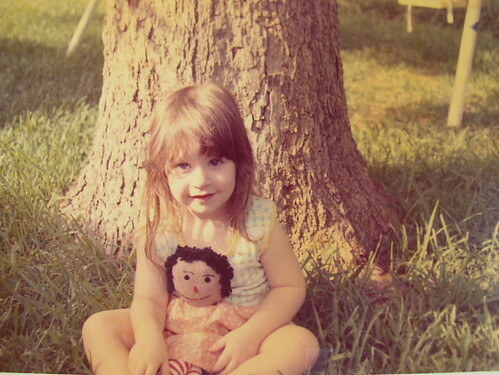 Not long after Petunia’s demise, I rarely played with dolls but I liked to look at them. My preference went toward stuffed animals. By the time I was 12, I could make dolls or animals with some degree of mastery. That was also the age when I began to babysit. Suddenly, there were small children for whom I could sew. The children clutched their handmade surprises with spontaneous, smiling embraces. In The Velveteen Rabbit, a child’s love made the toys real. In the material world, this love can be brutal and destructive, affectionately both. I made a rabbit for Kathy* when she was an infant, a welcome gift. I’d babysat for her older sister for two years, but I would not get to see either of them grow up in person. I went to college, the family moved to the Midwest, and we kept in touch every Christmas. When Kathy was eight, her mother wrote a note in the annual card that the rabbit was still cherished but in dire condition. Unsure whether a surprise replacement, or supplement, would be accepted, I found the old pattern and a large remnant of the original fabric. New Bunny was completed, then mailed to Kathy. I laughed. It had been loved to shreds. The only thing left intact was its soul. I was touched that something I’d made had been so special to a child. 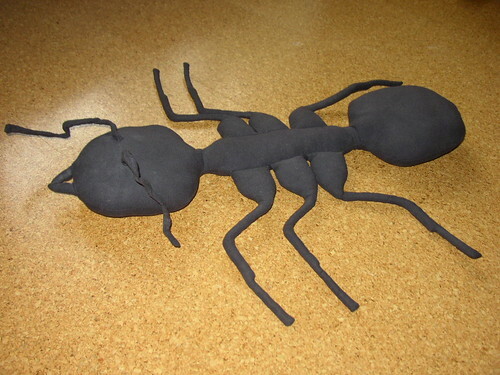 When we were friends and not yet a couple, I made a giant ant—to scale—for Todd. The inspiration came from a Monty Python skit we’d seen. The ant has traveled through our lives together and resides now on a high shelf in the hall. Todd likes his giant ant. Loves it. So charmed has he been by toys I’ve made for others that I’ve had to make more for him—several bears and birds. A childhood filled with Tonka trucks and action figures didn’t condition him to value only the plastic things. It could have, I suspect. We’re susceptible to temptation. Desire, and its fickleness, is part of human nature. We want, want, want. Anyone who grew up with magazines, catalogs, and especially television knows this all too well. Advertising makes attractive promises. There is implied value in having what everyone else has. A sense of belonging, status, identity. Subtle as it is, children learn this young. Mysterious forces compelled millions of children to ask for hula hoops, Davy Crockett hats, Barbie dolls, and G.I. Joes. Their parents complied. A generation later, those children grew into adults transmogrified into herds in pursuit of Cabbage Patch dolls, Tickle Me Elmos, and the latest game stations. Children aren’t buying and creating the demand themselves. I wonder how their true needs and wishes balance in relation to the creativity, greed, or opportunism of adults. I question the meaning as much as the merit. Hour after hour, thousands of toys are manufactured and shipped all over the world. These toys are often cheap to make, in material and labor, plastic and people worth pennies a day. So many end up tossed aside within minutes—the pacification, novelty, or amusement exhausted. So many get lost, forgotten, thrown away. This cycle is, by design, impersonal. There is no direct link between the people who produce the toys and the children who get them. Some magic is lost. As much as I loved my Baby Beans, and other children love their mass-produced toys, something ineffable was missing. What Tante Nan created and what I learned from my grandmother taught me about deeper connections. There is interplay, potentially sacred, between object and maker, but especially between the giver and the receiver. Three years ago, I felt a distinct shift in myself when six friends announced they were soon welcoming babies into their families. I wanted to be part of the celebration but in a more profound way. It was convenient to select a gift from a registry, and I still did that, in part. However, I decided to sew again, which I hadn’t done in years. I returned to a tradition older than assembly lines and garment factories. I sewed soft organic cotton knit onesies and gowns and made infant-friendly stuffed animals. As I worked, I thought about each child-to-be and the love waiting for him or her. There was an intimacy to the work, an awareness that a child would sleep and play with what I made. When my friend Alison awaited her Ethiopian daughter’s adoption, I pondered what to make for my new niece, who wasn’t by blood or law my niece. I decided on a mobile that could be dismantled and played with when Ella was older. To honor the ancestral and cultural heritage of both mother and daughter, as well as Alison’s interests in international peace efforts, I sought out the translation of three simple words. 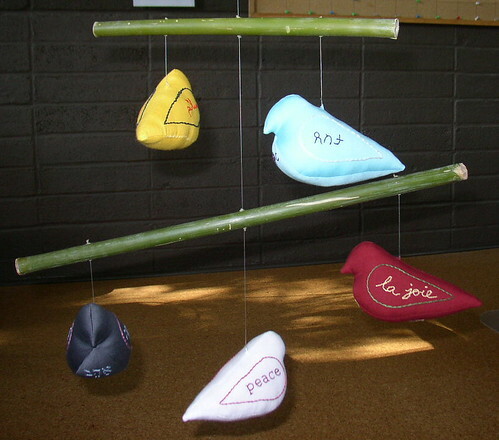 I sewed, stuffed, and embroidered five birds. They floated on their lines, declaring in English, French, Arabic, Hebrew, and Amharic my wish for Ella: love, joy, and peace. The hours I spent on the birds were a meditation of hope for her new life. Months later, an aunt asked me to make a present for her godson. She was touched by a little stuffed toy I made for her the previous Christmas and wanted something unique for him. She told me he was pre-school age, being adopted from Central America, and spoke no English yet. She learned that he liked trucks and bright colors. She wanted symbols and colors related to his native country a part of the toy. I was left to design and make it. The final product was a bright boxy soft delivery truck with Guatemala’s national bird on the sides, various symbols on the hubcaps, and a pocket on the back. I asked Todd to draw a little man to slip in the pocket, assuming a small boy might find that amusing, a place to put an action figure. The child adored the truck. My aunt said he exclaimed “Senor, Mama, senor!” when he discovered the paper man. 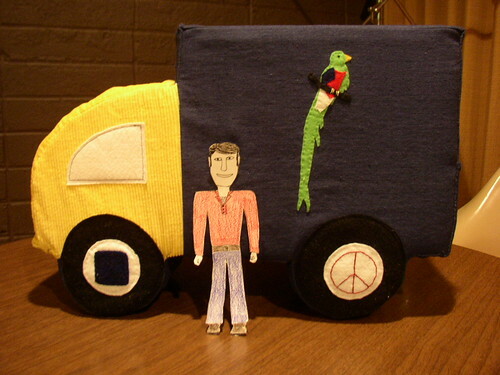 He pushed the truck and its two-dimensional passenger along the floor for hours. I will never meet the child who received this toy, but my meditation for him was as heartfelt as the one I did for Ella. Since I dusted off and oiled my sewing machine, I’ve made several baby outfits and many toys for children and adults. What I do is a novelty in this day and age, not a necessity. There’s a great deal of meaning in the effort for me and in the unexpected gifts that come. When it came time for Ella to learn how to button, zip, and tie, an option was to buy her a Dressy Bessy doll. However, they are manufactured with a pinkish skin color only, even in the 21st century, and that wouldn’t do at all. I offered to make something like it. I followed an old tradition of reusing discarded items and natural materials. The dress was fashioned out of vintage curtains, the body from a linen blend skirt, and the stuffing from sheep’s wool. Real baby shoes from the 1950s covered her feet. Alison said Ella loved the doll immediately. When asked what she should name it, Ella invoked what she calls me. My nickname is Tantie, which at its root is the French word for aunt. Thus the doll was christened Tantie Baby and now ranks among her favorites, handmade and Made in China. But before I shipped the doll 1,000 miles to Ella, Todd insisted that I photograph her. I was tired the night I stitched the last details and said I’d do it the next day. He went to get the camera, sat me on the sofa, and told me to smile. What appeared in the image was a role-reversed time warp. I was the aunt holding the doll which would go to a waiting child. In this embrace was the nature of legacy and love, soft and priceless. These are just perfect creations made with love and dexterity. You have put some ideas in my head. Tantie Baby knew who she was going to. She had lots of reasons to be happy. Yes, I knew about Mr. Potato Head’s earlier incarnation. Somehow, that seems more fun (and moldy) than the fellow today. Although I have a plastic Mr. PH in case children visit us. Fantastic line. Really enjoyed this piece, Ronlyn. Poor Bunny! If I’d had a photo, I would have likely told the story of the “wrestling buddy” I made for my brother. That was loved/beaten to death. It was the size of a large boy and played with a lot. Thrown from the bed, clotheslined, put in sleeper holds…There were many ragged seams and patches on it. Well, if this doesn’t just tug at the heartstrings! The lines Joe cited jumped out at me as well, and made me think of something. While I had plenty of plastic, mass-produced toys, my favorite was a hand-made sock monkey a friend of my mother’s had made for me while I was still in the womb, which was just named “Monkey.” I took that poor thing everywhere I could (couldn’t sleep without it, even) and yes, it to was loved to shreds. By the time I finally retired him to the shelf, most of his original body had been replaced with patches, and his button eyes were mismatched. I really kind of miss him a lot, right now. I adore that Monkey preceeded your birth and that you loved it so much. When an adult continues to patch something to hold it together, it’s an act of respect for the child. Somewhere, Monkey is missing you, too. J.M., if you were to write a children’s book with the spirit and prose of your comment, I would get one for every child I know–and plenty of grown-ups, too. 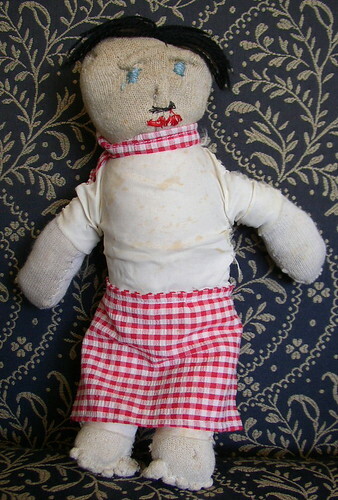 As a child -the toys I loved best were the beautifully stitched ones. In fact, I still have some of them. I always had envious eyes for an upside down Cinderella doll, my sister had. The raggedy top half was all patchwork and housefrau braids but when you turned her upside down – Magic! This amazing pincess appeared, with pearl encrusted dress and ringlet hair. Oh, I was so jealous! My mum is also a doll maker. She makes fat, winged women and amazing mermaids. She stitched for my step daughter an incredible mermaid with colourful sequins as scales and the most beautiful face and bodice. I can’t make anything with my hands but I do have the utmost respect for those who can. I wish I had learned to sew. I think it is an incredible talent and one I wish I possessed. However, I am very lucky in that I have my mum who often gifts me her creations, and lovely friends like you who make floral pussycats who I can admire. Oh, the topsy-turvy dolls! Such a classic! I have a pattern book with one that’s Little Red Riding Hood on one side and the Big Bad Wolf on the other. Surely, if you so pined for one, your mom could make a bedazzling dollie for you now. Let me know if your mom had pics of her dolls on her FB page or elsewhere. I’d like to see them. What an honor that your kitty sits on the shelf! I know she has a loving home. Your dolls are great, and your insights into the manufacture of toys bang-on. Thanks for the kudos. A little restraint with the toy production might not be a bad idea. Then again…better toys than bombs. A new bumper sticker, perhaps? I would totally put that on my car, next to my peace sign. Your creations are wonderful and I’m sure the recipients are thrilled to have something so tangibly filled with time and love. I absolutely adore the mobile and Ella’s doll. Thanks for sharing even more of your talents! It’s really heartwarming to hear from parents how much the children enjoy the toys. The mobile and Ella’s doll were both ventures into making my own patterns instead of using ones from a book. THAT is a learning process of its own. Everything about this story gives me the warm fuzzies. On my husband’s side of the family he had a Grandma that would make quilts for all the new babies. Sadly, by the time my youngest was born, Grandma had passed away before the quilt was complete. Fortunatley though, my husband’s step-mom, Nana, had taken up quilting and my Haley did eventually receive her special made quilt. These are the things we need to come back to. Your quilt story touched me. I know exactly how special such a tradition is. My aforementioned grandmother died in 2006. A year and a half later, I was at a cousin’s baby shower. She opened a card that was signed by our grandmother. Confused, she opened the gift. There was a handmade crocheted blanket. Her mother (my aunt) said that before she died, our grandmother asked her to give it to the next grandchild born in the family. Across the board, I think we’ve lost a lot of soul, for want of a better word, since the rise of mass production. We have no personal connection with the people who grow our food and sew our clothes and produce, or have a hand in producing, untold numbers of products we use daily. One of the appeals of letters, I think, was that they were written by hand, or they were before the typewriter came along, and the personality of the sender was evident in not only the words used but the way they were shaped. I think we miss that personal touch more than we know, and often don’t know at all–not consciously–and the fact that children have responded as they have to the toys you’ve made them is proof; a variation on “out of the mouths of babes.” Well done–and by that I mean the piece, too. I agree. The concept of value is distorted, too. For example, I pay more to buy my vegetables at the farmers’ market, but I also know the plants were pulled from the earth only hours before and I talk to the people whose efforts bring that to my table. Woe to us all if sending a handwritten letter becomes cost-prohibitive or unavailable because ye olde snail mail no longer exists. Woe even more so if we all become “too busy” to even bother. We’re CRAVING personal touch, often literally, at an exponential rate, especially as our world becomes more linked in to technology. I don’t think it’s any surprise that massage therapists are everywhere, and now and then there’s a surge in craft movements, like knitting. I wasn’t aware that there are more massage therapists than there used to be, but it makes sense. I noticed, when I lived in Eastern Europe, that people handled their children differently than they do here in the States. There was more palpable pleasure taken in physical contact. By contrast, parents in the States (I thought) seemed almost reluctant to hold–really hold–their children. Something of the puritanical was present. I fear for the end of the post office; I really do. And “plants that were pulled from the earth only hours before,” while so simple, is a luscious phrase. It makes me want to head to the farmers’ market immediately. A few years ago, Todd and I went to Milan. I noticed how affectionate the people were with each other–even the elderly couples who walked down the street. It was almost painful to see that much love given form. My sister is a massage therapist and sent me link once which mentions studies done on touch deprivation. It’s more damaging than one might think. Some incarnation of a post office will be around for a while. Like vinyl records, and paper books. You’re sweet picture is in the cube! It’s really, really hard to get cube-space. Oh my!!!! Lookee there! Thanks for letting me know. I don’t always skim the cubes, so I might have missed it. You’ve made it into the big time now! Oh, my, how much do I love this story and these pictures! So glad you could stop by to take a peek! I hope you’re making excellent progress on your next book. I don’t know if it’s “excellent” progress, but I’m definitely moving forward. Knowing my long and winding process, I’m pretty happy with where I am right now. Amen. I’m right there with you. Like Zara’s, my cat sits proudly on my bookshelf as well; often sharing the room with her breathing counterpart (the two are approximately equal in intelligence… the living version is one of the most ridiculously vacant animals I’ve ever had the pleasure of knowing). As others have noted, there’s a loss of warmth that comes in with mass production. I think it comes down to what and how the things is; I have no problem driving a mass-produced car, but there’s something different about an artistic creation. Oh, your toy cat is imbued with tremendous intelligence, yet knows that the greatest wisdom is silence. Ha. How sweet that you keep on your shelf! I love your handmade treasures! What a wonderfully written essay. 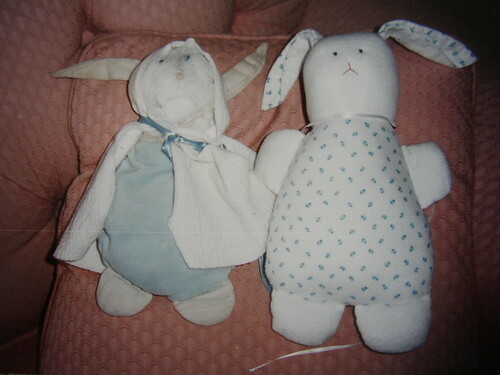 I wish I had the know-how to include a photo in this comment of George the Bunny whom I’d recently sewn from remnants for a friend’s first baby. Handmade items just have so much more charm and character. I’d fully intended to sew zombie chickens for my friends for Christmas as well, but I’ve fallen very, very behind in zombie chicken production. I’d love to see a photo of the bunny. We’re both on Facebook, so send one to me if you’re so inclined. I think I would like to visit you one day Miss Ronlyn. I would relish some quiet time, sitting and sewing, while we got to know each other. *get* to know each other. I pressed ‘submit’ before I said how much I enjoyed your post, and in particular the photographs of your wonderful creations. And every time I look at the photo of you and Petunia under the tree, it reminds me of a child I knew many years ago and whom I adored and loved so much. I will try and find some photos of some of my creations – I have a few somewhere, but most things I have made now live in other people’s homes and I don’t have a record of them. I think my favourite that you have put up is Francois. He is so beautiful. Miss Jude, I would love to have a little sewing circle with you. I can only imagine how cute that aforementioned child was…. Yes, please share photos if you can find them. Francois cracks me up every time I look at him. I wish I knew what was going on in my head at the time. Actually, he was a second choice for the piece. The first is Maestro, who has disappeared somewhere in my parents’ house and I have no photograph record of him. Perhaps it’s just as well because Maestro never received pants, but did carry a conductor’s baton. Ronlyn what a lovely post! When my youngest daughter was three she was in love with everything Madeline. She knew the stories by heart and could pull together an approximation of a French school girl outfit from the dress up bin. But more than her love for Madeline, she adored her friend the lively Pepito, son of the Spanish ambassador. For her birthday she wanted a Pepito doll — of which there were none. So I decided to make him. My hands were not meant for sewing and he was rather flat with black curly “hair” (yarn gone bad) and a red suit sewn directly onto his body with a wide white collar. Pepito sat on her bed for a very long time, no matter that his legs and arms flopped and his hair could only be called an afro gone bad, she did love him. Somehow, years later, Pepito ended up on a shelf in my older daughter’s studio — where she has christened him “Jack” as in Jack White from the White Stripes. So Pepito/Jack lives on.. my one and only attempt at making a doll…..
Oh, what a lucky girl your daughter was…and no doubt still is! That’s real love–when a person takes a risk to do something unknown to make another heart happy. I love that the doll got another life as Jack. You may well have created an heirloom, Robin. first off, you’ve got talent, girl! i love your creations. as a kid i loved to sew and would try to make things out of old pantyhose and cotton. but somewhere along the line my skills froze (at about aged 12) and now my stitching is positively Frankensteinian. My aunt said he exclaimed “Senor, Mama, senor!” when he discovered the paper man. We could trade some stories! I made dolls out of pantyhose, too. One was part of a social studies project in 7th grade. I guess I sewed enough when I was younger so that when I’d do a project now and then, it was sort of like riding a bike. Although the slip cover I did for our sofa–which turned out fine–was a massive project compared to hemming pants. Yeah, I was touched myself. My aunt sent photos of her godson playing with the truck and his “senor” and told me what he said. Total aawwwww…..
Hope your writing is going great!!! You know, reading this, friendships bracelets came to mind: the delightful and painstaking work that went into forming those tiny knots, a particular friend in mind… And, then, we’d wear them to the point of fraying and discoloration and general grossness, knowing that once they were tied onto our little wrists, they were there for a pretty long haul. Man. Also makes me think of Billy Collins’ “The Lanyard.” Such fullness, sweetness in that one. Oh, friendship bracelets! Yes, you understand exactly what gets transferred. We could all use a little more of that. I’m going to look up the Collins poem. I’m not familiar with it. Cool–I think you’ll dig it. I love the fact that you enjoy things made by hand. These days everything is computerized and kids have no concept of imagination and building things by hand. I must say though, that my sisters 4 boys that range from 9-17 still play with legos and the amazing things they come up with is mind boggling. They get their creative side from their mom who spent hours in the basement with me making barbie doll clothes, pillow cases, sheets and such. My mom croqueted little afghans and clothes for us. She made all of our Easter outfits and later on countless christening gowns, afghans that have lasted for years, mittens, gowns and hats. The love that went into every stitch will be forever cherished. My brother was into Legos and could build things that blew my mind. His spatial relations had mine beat. He channeled those gifts into a good career. Part of the reason I made toys when I was younger was not only that I was taught the basic skills, thanks to my grandmother, but also was ENCOURAGED to keep doing it by the people around me. Learning a new craft or skill doesn’t come with instant gratification. Practice matters. I don’t think all is lost, though. I have a number of friends who took up handcrafts in their adult years–knitting, painting, scrapbooking. Those with children might be modeling options of how to enjoy one’s free time. I love that your family has heirlooms from your mom! The beauty and truest value of those objects hold over time.